Planning the UK's energy future is a difficult task and getting more challenging. A secure, sustainable and affordable energy supply should be a priority for any government. Gone Green is a world where green ambition is not restrained by financial limitations. New technologies are introduced and embraced by society, enabling all carbon and renewable targets to be met on time. Slow Progression is a world where slower economic growth restricts market conditions. Money that is available is spent focusing on low cost long-term solutions to achieve decarbonisation, albeit it later than the target dates. No Progression is a world focused on achieving security of supply at the lowest possible cost. With low economic growth, traditional sources of gas and electricity dominate and there is limited innovation changing how we use energy. Consumer Power is a world of relative wealth, fast paced research and development and spending. Innovation is focused on meeting the needs of consumers, who focus on improving their quality of life. Probably the most important theme to come out of these scenarios is that Gone Green is the only scenario to achieve all renewable and carbon targets on time. It is also probably the most challenging scenario. Under this scenario, LED lights will be the only viable light bulb option by 2030, renewable power output will be comparable to that of conventional power plants by 2026, and sales of air source heat pumps will top 300k by 2030. Maybe, but you might be a touch sceptical. In all the scenarios National Grid believe that there will be sufficient gas supplies, although the sources remain uncertain. This big issue is of course shale gas. If large scale planning permissions are not forthcoming, it will be replaced by imported gas. Electricity margins will continue to be very tight over the next few years until new capacity kicks in from 2018/19. National Grid believe they have that covered with their additional balancing reserve. That will be provided by Peterhead in Scotland. Interconnectors are of growing importance and Great Britain remains a net importer of electricity in three of their four scenarios. Finally, the grid faces significant operational challenges coping with intermittent wind and solar power rather than conventional power stations. The presentations were helpful in explaining the scenarios, but the panel discussion was a bit bland. It needed some more challenging panel members and questions. While there is a cross party consensus on targets, the debate is how to reach them. The recent announcement of onshore wind subsidy creates the very uncertainty that investors hate. Scenarios are all well and good, but someone has to deliver the capacity. While government still talks about all the objectives, it seems clear that they are prioritising affordability over decarbonisation. There may also be too much focus on supply side, when we should put more effort into reducing demand. The operational challenges of distributed generation are unlikely to be resolved until we get viable electricity storage options. This is effectively turning the usual supply and demand model on its head and could lead to attempts to persuade energy users to use energy when it's available. Anyone for windy or sunny day tariffs? I allow myself a wry smile at events like this when civil servants are quizzed about what is in effect state planning of energy, introduced by a Tory government. This was supposed to be a temporary process, but no one is predicting it's imminent demise. In fact governments across the world are getting more involved in energy planning. It's simply to important to leave to the market. What about Scotland in all this scenario planning. I'm afraid it barely gets a mention in the 200+ page book and the assumption is that imports from England and further afield will plug the gaps in our generating capacity. And gaps there will be when the wind isn't blowing. If you want to understand the risks and challenges of our rapidly changing energy system, this is the book for you. But like me, you may conclude that it would be simpler and cheaper to return it all to public ownership. As the political storm over the UK government's decision to end subsidies for onshore wind power rumbles on, we take a look at wind power developments in Scotland. Renewables now generate almost half of Scotland's energy with wind power at record levels, according to the latest data. Wind turbines produced 4,452 gigawatt-hours of electricity in the first three months of this year, up 4.3% on the previous most productive quarter. This is enough to power Scotland’s 960,000 households for a year. Renewable sources provided 49.8% of electricity used in Scotland in 2014, with installed capacity rising by 9%, or 7,383 megawatts. The cost of wind power has come under attack from economist Tony Mackay, who has claimed that the subsidies paid to onshore wind farms in Scotland are "unnecessarily high" and have led to "supernormal" profits for businesses and landowners. He argues that the subsidies received by wind farms has on average been, "between 2.5 and 3 times what was required to expand wind farm capacity to meet Scottish Government [emissions] targets". The explanation for these profits are that while other countries subsidise capital investment, in the UK operating costs and revenue are subsidised. As a consequence electricity bills in Scotland are now around 10% higher than they would be without subsidies. Even with the replacement of the overly generous Renewables Obligations (RO) subsidy scheme with the more limited and competitive Contracts for Difference (CfD) subsidies, the UK will still be "stuck with the current shambles of subsidies for wind energy projects,". Scottish Renewables responded that subsidies add around 82 pence a week (or 7%) to the average Scottish bill. Andrew Smith argues that wind power in the UK is more expensive than it should be because of regulatory and planning uncertainty. That adds to developers costs and means that much of the supply chain is outwith the UK. Despite this the latest round of CfD bids shows that it costs about the same as solar. He argues that government policy could give windfarm developers much greater long-term assurances of a supportive and consistent policy environment, thus lowering their risks and hence lowering costs. This will improve transparency, and reduce the cost of onshore wind further. It would give certainty to investors through decisiveness and leadership, and it would show that the government is taking a pragmatic and cost-effective approach to tackling climate change. Frederick Dahlmann from Warwick University argues that the future for wind power is locally based wind farm cooperatives using crowd funding. He points to the experience of Denmark and Germany where local authorities are much more engaged in the process. He illustrates his point with a proposal by Yorkshire-based Edgehill, which seeks to raise £2.5m from investors chipping in as little as £50 to build ten turbines in ten different rural locations. With their risks and benefits shared between large numbers of individual investors, these projects are used to keeping locals happy, dealing with NIMBYs, and bringing them on as investors. A new report by the climate change body ClimateXChange claims that developers sometimes under-assess the impact of wind farm noise and appearance on residents living nearby. The study looked at how the visual, shadow flicker and noise impacts predicted by developers at the planning stage compared to reality. It concluded that in some cases what was set out in planning applications did not match the actual impact. It also found that efforts to engage with the public had not always adequately prepared residents for the visual, shadow flicker and noise impacts of a development. "I find it bitterly disappointing that so little of the manufacturing associated with wind farms in Scotland has been carried out here. That is a major failure on the part of the Scottish Government and does no credit to the biggest developers, Scottish Power and SSE, who have had the benefits of major planning consents and vast subsidies through the Renewables Obligation but failed to reciprocate by creating an industry worthy of the name." Brian also suggests some practical measures to mitigate the impact of the decision. Specifically support for community based schemes and the islands. As I previously argued, the UK government decision was right in principle, but wrong in terms of timing. There should be room to rescue a viable future for wind power as part of a more balanced energy policy. The Chancellor's summer UK budget today was long on spin, but the substance was less impressive once you delve into the detail. The headlines are about wages with the introduction of a new national 'living wage' for all workers aged over 25, starting at £7.20 an hour from April 2016 and set to reach £9 by 2020. In effect this is an increase in the national minimum wage for the over 25’s, not a living wage at all. As the Living Wage Foundation has already pointed out, it is calculated on what the market can bear, not on what workers need to live on. An annex to the OBR report covers the economic impact and interestingly claims there will be a minimal impact on jobs. The wages pill has been sweetened for employers with cuts to Corporation Tax and employer National Insurance contributions for small employers. While this will help low paid workers outwith the public sector, it has been set below the level of the Scottish Living Wage that applies to most UNISON members in Scotland. If the Scottish Government follows the Chancellor’s lead, as they generally do, public sector workers face four more years of pay restraint with increases capped at 1% per year. It could be even worse, particularly for young members and low paid members with families. The freeze in working age benefits hit families hardest and young people also lose Housing Benefit until they reach 21. They don’t get the new living wage either. One of the real benefits of the English approach to supporting disadvantaged students at university was maintenance grants. They have been abolished and replaced by loans. The Tories really do have it in for young people - no wonder they oppose extending the vote to 16 year olds! The increase in income tax personal allowances are a help, but they are a regressive tax cut that benefit higher paid workers more as this IFS chart based on previous plans shows. The Resolution Foundation has also provided a helpful explanation of why wages alone don't work. 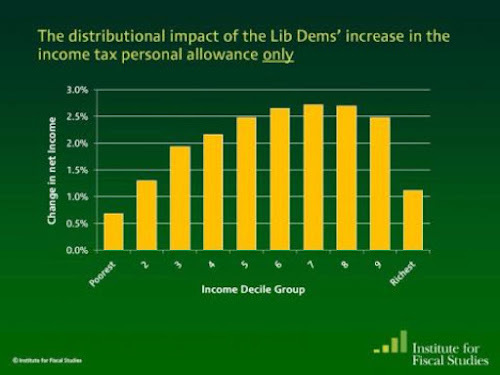 The rich also gain from changes to inheritance tax that will cost the Treasury almost £1bn. Tax relief for £1m home owners won't help many in Scotland and will simply entrench intergenerational inequality and increase house prices. It will do nothing for house building. The OBR estimates that the budget changes will cut affordable housing by 40,000. This table from the OBR report shows the extent of upper middle class welfare in this budget. The measures to tackle tax avoidance are welcome, even if pinched from Labour's manifesto. However, the OBR rates the estimates of income raised as 'very high' uncertainty. They will also have to deliver on the extra HMRC staff, after years of cuts. There is some confusion here between the Chancellor's claimed £750m for HMRC and the Red Book's £250m. The Non-Doms are also being phased out very slowly, giving ample time for the Chancellor's pals to find new ways of dodging tax. 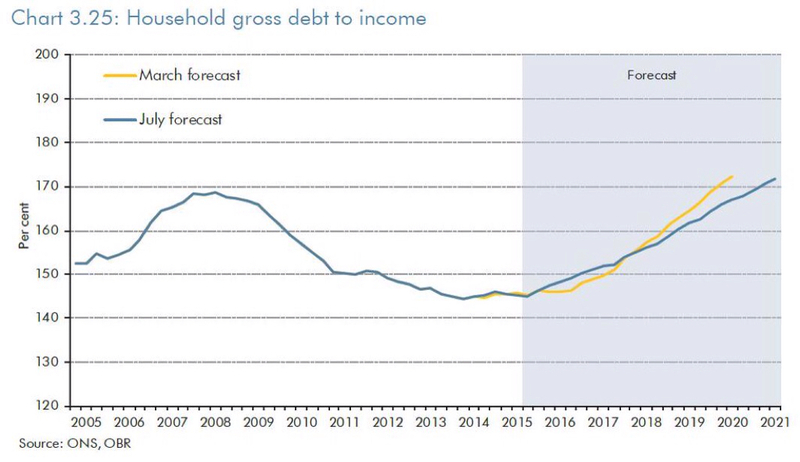 The OBR also estimate that the economic recovery will slow slightly and still depends on an significant increase in household debt. 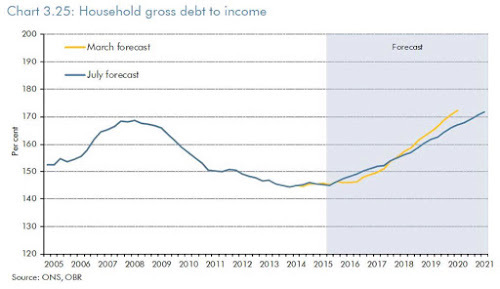 I always find this a scary chart as we all recall what happened last time personal debt increased in this way. After wages we need to look closely at the impact a UK budget has on Scottish public spending. 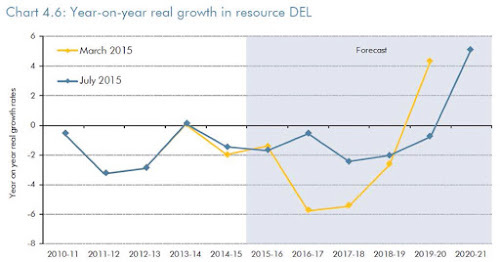 Cuts in departmental spending (RDEL) will follow a much smoother path than was implied in March, moving away from the previous ‘rollercoaster’ pattern. 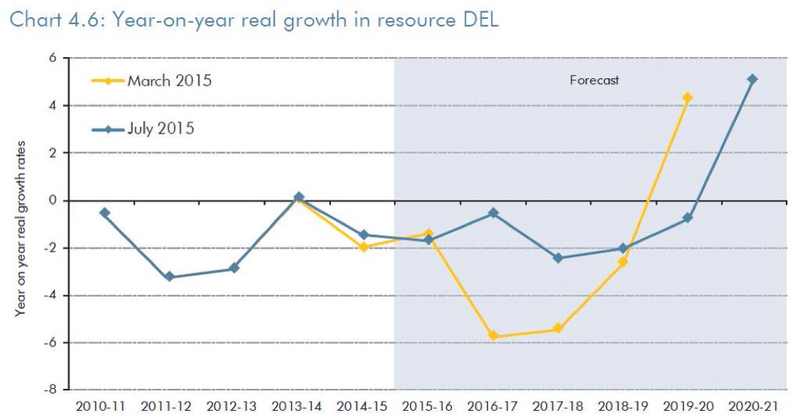 Real terms RDEL cuts now range from 0.5 to 2.4% a year between 2015-16 and 2019-20. In March, the real cuts in 2016-17 and 2017-18 were 5.8 and 5.4% respectively – larger than any seen in the previous Parliament. RDEL spending is now assumed to fall by an average of 1.5% a year in real terms over this Parliament, compared to the 1.6% over the previous Parliament. Essentially the cut is similar, but spread more evenly over a longer period as this chart from the OBR report shows. It is difficult to calculate the Barnett consequentials until we see the departmental allocations for devolved services in England. That will probably become clearer in the Autumn Statement. However, the limited good news is that the massive cuts planned for the next two years will be somewhat reduced from the March plans. The impact on jobs is still significant. UK general government employment is estimated to fall by 0.4 million by the first quarter of 2020, leading to a total fall from early 2011 of 0.7 million. These figures are 0.2 million smaller than projected in March, but still equate to a 13% overall reduction in headcount. The Scottish job losses could be between 30,000 and 40,000 posts by 2020. The OBR now publishes tax forecasts for the devolved administrations. They only cover the Calman provisions, not the more extensive powers being debated in the Scotland Bill at Westminster. This chart sets out their estimates. For those interested in pension funds there will be considerable analysis of the tax changes. I also note that tucked away in the Red Book is a reference to pooled investment of local authority pension funds. Something we are at least considering in Scotland. Overall, doing something about some wages is I suppose some progress from this Chancellor, even if it is only a partial plug for benefit cuts. Welfare cuts for the poor paying for tax cuts for the rich is a more predictable element of the budget along with spending cuts that aim to cut vital public services. I also suspect this is a budget that requires more analysis of the detail - with more horrors yet to be discovered. As we await the assault on working people in the first Tory budget next week, new data points to better ways of supporting the low paid and reducing inequality. The Joseph Rowntree Foundation has published its annual research on the The Minimum Income Standards (MIS), which asks members of the public what goods and services they think different types of households need to live to an adequate level. They turn this into a useful calculator that lets you compare your income to MIS. The pause in inflation helped people on low incomes to become slightly better off relative to their needs in 2015, despite working-age benefits and tax credits rising by only 1 per cent. However, households on low incomes remain much further behind what they need than before the recession. The gap between family incomes and what the public think people need for an acceptable living standard has grown sharply. 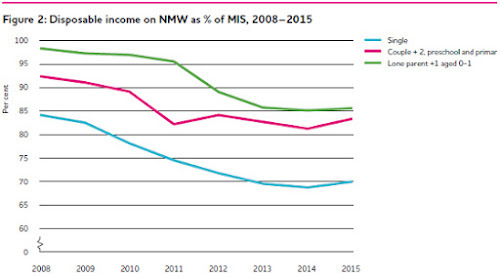 The earnings required to achieve the MIS for a single person stayed stable at £17,100 a year. Earnings requirements fell for families with children, helped by a small increase in Child Benefit and tax credits. A working couple with two children must each earn £20,000 to reach MIS. A predicted return of modest inflation combined with a planned freeze in benefits, tax credits and Universal Credit will create a less favourable environment for households reliant on help from the state. The July 2015 special Budget is likely to make matters much worse. The Institute of Fiscal Studies(IFS) has published a short analysis of the annual DWP statistics on the distribution of household income. After inflation, median (middle) income grew by just under 1% in 2013–14, following a similarly small rise in 2012–13. This represents a slow recovery in average incomes, which follows the sharp decline between 2009–10 and 2011–12 when workers’ real earnings fell rapidly. It did mean that real median income had crept back to within about 1% of its pre-recession (2007–08) level, though it was still almost 3% below its 2009–10 peak. In 2013–14 incomes grew at a similar rate across almost all of the income distribution, resulting in little change in income inequality. At 0.34, the Gini in 2013–14 remains at around the same level as in the early 1990s, but lower than before the Great Recession. This is largely explained by the fact that while real earnings fell sharply between 2009–10 and 2011–12, benefit incomes were more stable. Since poorer households get a greater share of their income from benefits, their incomes have risen relative to higher-income households. However, once you take account of falling mortgage payments, overall inequality fell less than those numbers suggest since it is largely better off households who benefited from this reduced cost. The latest data show little or no change in poverty rates, for the population as a whole and for the major demographic groups (pensioners, working-age adults and children). However, as IFS warns, we need to look at trends over several years. We also need to look at how geographical is the wealth gap. The richest place in Scotland is a third better off than the poorest. ONS data shows that gross disposable income averages just over £20,000 a year in Aberdeen and Aberdeenshire and in Edinburgh, compared to just under £15,000 a year in Glasgow and North Lanarkshire. As we approach the special budget and the likely attack on social security for working people, the TUC and the Child Poverty Action Group (CPAG) have urged ministers to improve Universal Credit rather than raising the income tax threshold to £12,500. In a study of 13 options, the tax threshold proposal cost the most and came bottom for reducing child poverty. A package of improvements to Universal Credit including increasing work allowances, would reduce child poverty by 460,000. Alison Garnham, chief executive of the CPAG, said: "This comprehensive analysis shows the Chancellor must be careful not to back the wrong horse when it comes to the Government's flagship policies. Rather than committing billions on the costly and poorly targeted policy of raising the personal tax allowance, the Treasury should stop starving universal credit of the investment it needs to fulfil its poverty-reducing potential and justify the massive upheaval surrounding it. The evidence is clear that investment in tax credits is incredibly effective in lifting children out of poverty." While increasing wages remains hugely important, these reports highlight the importance of in work benefits to families in particular. Despite the 'strivers' rhetoric, these are likely to be the biggest losers next week. 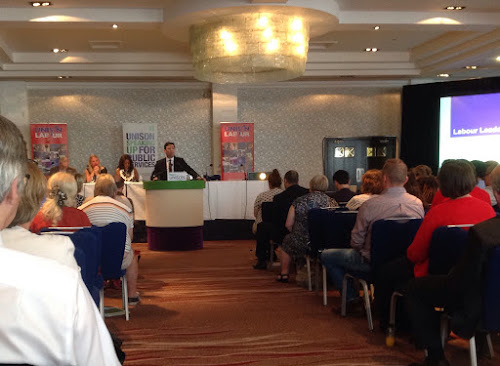 I was at the UNISON Labour Link hustings for the UK Labour Leadership today in Manchester. With our focus on the Scottish leadership election's earlier timetable, this was my first real opportunity to listen to the candidates. Andy Burnham's pitch was that he was the man to stand up for Labour values and to take the fight to the Tory government. Citing his record on the NHS, where Labour had a clear lead, opposing privatisation and his record on improving industrial relations in the NHS. He would repeal the latest planned Tory anti union laws arguing that trade unions provide the 'cleanest money in politics'. His positive policy proposals included bringing social care into the NHS and while supporting greater home ownership, any right to buy has to include like for like replacement in law. He felt Labour did spend to much when the economy was growing, but didn't say what spending he would have held back. On Scotland, he argued the party has had a grudging approach to devolution. Labour is too Westminster centric and that's a culture that has to change. He supported a more autonomous Scottish Labour Party, although didn't appear to understand that policy and organisation over devolved issues is already decided in Scotland. He appears to be arguing that the solutions are culture and behaviour change, rather than structural. His final pitch was that the Westminster elite doesn't understand the lives of people and as a consequence the voters have lost their emotional contact with Labour. Home ownership, comprehensive education and quality care are his key issues. Support people's aspiration but leave no one behind. Liz Kendall had warm words about the work of public service workers and the public service ethos. She was supportive of UNISON Ethical Care Charter and opposed to Tory health reforms in England. She was opposed to the Tory housing association right to buy that has no like for like replacement. She wants a shift from housing benefit to building houses. 'Benefits to bricks' is a good slogan but she needs to explain how she would achieve such a transition. Her key theme was regaining people's trust on the economy. The Low Pay Commission remit should change to look at how move to the living wage sector by sector. Devolving power to cities and regions to cure short termism and create high skill, high wage economy. Other than learning from the German economy, it was again a little light on solutions. Her position on sound public finances sounded very like austerity lite. On Scotland, she doesn't support an independent Scottish Labour Party. Instead supporting a more federal party in Scotland and the English regions. She argued that Scottish Labour had long term problems prior to the referendum rather than focusing on the Better Together campaign. Labour needs to present an optimistic picture of the union. Her final pitch was that to win in 2020, Labour needs to change and she is the change candidate. This involves a positive alternative of a better life in a country where the chances of succeeding don't depend on birth, race or gender. Sound public finances and devolving power are her key elements. Jeremy Corbyn had the best jokes, even if some were a bit laboured. He also had the strongest policy pitch, less vagueness, particularly on trade union rights and TTIP. Organisationally, he wants to make Labour the centre of radical political activity. His main pitch was that Labour lost the election because it didn't offer an alternative to austerity. He criticised last Labour government for PFI contracts and would bring them back in house with cheaper direct borrowing. He would retain public ownership of banks and make them work for the real economy. He understood the importance of national collective bargaining to raising wages and proposed a cabinet minister for labour. He supports a constitutional convention to look at devolved powers, but warned about the poison chalice when powers come with cuts - 'beware of Tories bearing gifts!' If right to buy in housing associations why not right to buy from private landlords. He also supports rent controls. He was prepared to consider a federal structure for the party and clearly understood the political mistakes of the 'Better Together' campaign. He would expose the consequences of the SNP's full fiscal austerity, rail and ferry privatisation. The contrast with his final pitch was that he didn't make a 'presidential' case for his candidature. Using Tony Benn's the 'best leaders are the ones you don't remember because we did it ourselves'. He would focus on ending austerity and tackling inequality and would go after those who caused the crash not blame migrants, poor and welfare claimants. Yvette Cooper's focus was on what Labour needs to do to win. She explicitly defended Labour's record arguing that it wasn't too many public service workers that caused the crash, it was the bankers. Although she accepted Labour made a mistake over the lack of banking regulation. She opposed the planned Tory union laws and cuts to tax credits. She supported the living wage and public sector pay increases with a gender audit for all policies. She also argued Labour was not ambitious enough on housing, we should be building 300,000 a year. She would tackle UKIP on their policy positions and take a strong position on the exploitation of immigrant workers, but "when you hear racism you should always call it out". She understood welfare to work but based on her personal experience she won't demonise benefit claimants. On Scotland, she supported more party devolution including policy, but not an independent Scottish Labour Party as contrary to solidarity principle. Her final pitch was that the voters are looking for someone who can be Prime Minister. We need head and heart - voters need to trust us to deliver. Cameron clearly has a 'woman problem' so why not elect Labour's first women leader. While today's hustings was helpful, I'm not sure it took me much further in deciding who to support. Liz Kendall was stronger on values today than I expected, but she still leaves me with the impression that she carries those values lightly. Her policy pitch sounds very general and appears to lack substance. Jeremy Corbyn had the policy lines that I support and strong Labour values. Most importantly, he understands the need to challenge austerity. However, I recognise that his presentational style could be a challenge in modern elections. Andy Burnham not only has strong presentational skills, but importantly, he also sounds authentic. He has a strong analysis of what's wrong, but weaker and vaguer on solutions. It may be that he is trying to build too big a coalition and risks losing a distinctive position. Yvette Cooper was also strong on presentation and sounds authentic. Her policy pitch was stronger than I expected, but still vague on some of the more difficult issues. I'm afraid none of the candidates had a good grasp of the position in Scotland. I'm not sure most of them even understand the current party constitution, let alone what changes are necessary. The Deputy Leader candidates weren't any better in the afternoon. UNISON is going to take some time before reaching a decision on who to support later this month. That gives me a bit more time too. Today edged me in a direction, but I wasn't bowled over.